Technological societies are understandably charmed by belief in logic. Our machines are born of the industrial and scientific revolutions, where logic clearly works. This has encouraged the perspective that we too should aspire to be purely logical. Star Trek’s Spock became an icon for this ideal. Thus, the belief has been that people respond to logic and getting people to do what you want may rest upon telling them what you want them to do and why they should do it. However, the idea that human behavior primarily responds to logic is in some ways appealing but fundamentally flawed. Neurological evolution has created a human brain orchestrated primarily around emotion rather than logic. The logic systems are newer, less “primal” and – notably – significantly subservient to emotions. Overall, emotions control, rather than being controlled. The basis for this is neuroanatomy. The core brain system for emotion is the limbic system, a deep and central system that literally “sees” incoming information before logic has access to it. For very real neuroanatomical reasons when new information carries risk or opportunity we routinely react before we think, we jump to conclusions, we respond with our “gut”. The reason for this is that evolutionary survival has depended predominanty on reaction rather than logic. In the human brain emotions are the predominant conductor of reaction. 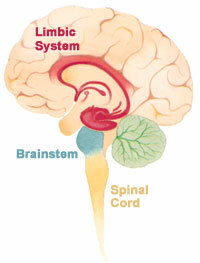 The limbic system is the brain’s emotion center. See Figure 1. Neuro-evolution has specifically placed this system deep in “old brain” (from an evolutionary perspective) where it has first access to incoming information. Interestingly, the cortex – the “wrinkled”, surface portion of the brain we normally see depicted – anatomically has almost no direct access to incoming information. It depends on information being passed to it by deeper structures, including the limbic system. Emotions control the way information is passed to the cortex. Emotions lead to focus on certain information and exclusion of other. Thus the limbic system has important ability to sort incoming information. What we see, or hear, or feel is partly regulated by our emotional state. If we are frightened then incoming information tends to be biased toward looking at information through the lens of risk (thus creating a tendency to see things negatively and over-react in this perspective). If we are happy and comfortable then incoming information tends to be biased towards optimism. So, for example, in social life we’ve learned not to bring challenging informaiton to someone “on a bad day”, because their tendency to negative interpretation and their level of negative response will be higher. Conversely, performers “warm up” a crowd before a key performance in order to incline the crowd toward a more positive reaction. In business, and specifically in change management, having a basic perspective of emotional neuroanatomy is very important information. It is a key to harnessing the collective genius within an organization, in Wriston’s perspective. It reveals that emotional reaction is not a weakness but rather a part of being human. Yes, we can to some extent “control our emotions” – but at a price. Not only does this take energy (draining it from other uses) but also it creates ambivalences within the brain which reduce effectiveness and creativity. Having a perspective emotions advocates making particular efforts to present a major organizational change in certain ways in order to utilize emotion to increase receptiveness to the upcoming change. This does not mean there is always an attempt to “put on a happy face”. To the contrary, a negative image and sense of impending risk can be specifically used to bias organizational staff away from apathy and toward engagement. Daryl Conner, for example, put forth the now-famous image of “The Burning Platform” as a metaphor for mobilizing an organization toward needed action (Leading at the Speed of Change, Daryl R. Conner, Random House). Similarly, John Kotter has emphasized the need for building a sense of urgency as a way to mobilize action (A Sense of Urgency, John P. Kotter, Harvard Business Press). In The Upside of Irrationality author Dan Ariely looks in detail at business/economic consequences derived from this critical issue of emotions. He reveals that business, and particularly the field of sales, is critically dependent upon dynamics which derive from emotion’s control over logic. For example, reciprocity is a sales dynamic wherein we have an emotional tendency to reciprocate for positive benefits given to us. (Ariely discusses the probable evolutionary foundations for this trait.) The sales industry has learned that this tendency to reciprocity may lead a customer to buy something that logic would reject. When salesmen give something away for “free” the action is an intentional ploy acting in some way to encumber the emotions of the potential customer – inclining a customer to reciprocate with a purchase. Thus, this emotional encumberment generates more sales than would occur if the “freebie” weren’t provided. Because his focus is on “irrationality” (non-analytical behavior) Ariely frames emotional mechanisms as an encumberance to rational thought. However, there is another whole side to this issue: using emotions to build engagement, enthusiasm, and perserverence in the face of adversity. In later blog entries I’ll consider these benefits to “irrationality”. To harness the collective genius within an organization, as Wriston referenced, we need to build organizational change systems that capture the important role of emotions in determining behavior, particularly in the contexts of engagement, resistance, cooperation, and commitment. In the next four entries to this blog series I’ll look at each of these four individually. They are all related, but not the same. Each is handled at an organizational level in a somewhat different way for purposes of change management. Understanding the role of emotions in human action and utilizing them to build organizational power is actually the logical thing to do.